Tendon ruptures are fairly uncommon however they can and do occur. They are often associated with sharp sudden movements, a sudden onset of symptoms and considerable loss of function or disability. Before we can discuss what you should do if you have or suspect that you have a tendon rupture, we first need to discuss what a tendon is. Tendons are tough connective tissue bands or cords that connect muscle to bone. They are responsible for transmitting the forces generated by muscles to the bones that they are connected to. They consist of various types of collagen organised into fascicles. Theses fascicles are then organised into bundles, which are then surrounded by a membrane called the epitenon. This unit is then described as the tendon. What can go wrong with Tendons? There are broadly 2 categories of tendon problems tendon rupture and tendinopathies. Tendons are extremely strong as mentioned above, therefore normally they will only rupture under fairly high loads unless there is some underlying problem affecting the strength of the tendon. For example certain antibiotics such those of the fluroquinolone class, the patient having rheumatoid arthritis or gout, there being a previous history of tendinopathy or previous steriod injection. The later being one of the reasons for the reluctance of medical staff to repeatedly inject steriods. A paper from 2015 found that approximately 10% of those who sustained an achilles tendon rupture had had a pre-existing tendon problem. Therefore the take home message would be that if you participate in a sport or activity, where you are placing a substantial amount of load on your tendons. It would be prudent to address any tendon discomfort properly and not to just ingnore it. In general rupturing a tendon is not that common with the same paper referenced above reporting an incidence of 7 per 100,000 for achilles tendon ruptures and noting that over 80% occured when taking part in recreational sport. Obviously any tendon can potentially rupture, however the four that commonly occur in an otherwise healthy population are the quadriceps, achilles, rotator cuff and biceps tendons. Direct truama to the area. In our clinical experience if you have sustained a tendon rupture you will be in absolutely no doubt that you have sustained a significant injury. If it is affecting your leg you will be unable to walk and if it is affecting your arm you will have lost the ability to use your arm. You should attend A & E if you have the above symptoms and you think that you may have ruptured a tendon. The staff in A & E will assess you and if there is a rupture present, decide whether it is complete or partial. You may need an X Ray to assess if there is any bony damage present. For example an avulsion fracture where the tendon and a small piece of bone are pulled off the bone. What happens next will depend on the site and extent of the tendon rupture. For example quadriceps ruptures will normally be surgically repaired. Whilst biceps, achilles and rotator cuff tendon ruptures will often be managed non surgically initially. 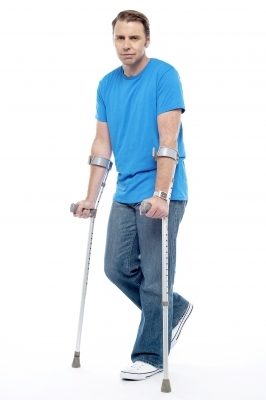 For a tendon rupture that affects your ability to walk you will need crutches or some other walking aid. In the case of an achilles tendon rupture that is being managed non surgically you will need a moonboot with a heal raise. After a period of immobilistion which will vary depending on which tendon has been injuried and the management approach which has been chosen. The patient will start the rehabilitation journey. It is extremely important that the healing tendon is loaded optimally to facilitate as full and as quick a recovery as is possible, whilst minimising any loss of function and the risk of re-rupture. There is good research evidence that collegen synthesis and collegen remodeling is positively affected by loading. These two processes are essential for a strong and pliable repair. Therefore a rehabilitation approach which includes stretching and range of movement exercises to restore range of movement, strengthening exercises to restore power and strength and eventually end stage rehabilitation including plyometrics and a graded return to training and participation in sport or other activities is essential. However It is also essential to get the timing, volume and intensity of these types of training right. Otherwise the tendon may be lengthened excessively if stretching is started too early or the tendon may rupture if a strength or plyometric programme is too aggressive, implented too soon or there is simply not enough recovery planned. All of the physio’s at Midlothian Physiotherapy LLP are extremely experienced being qualified for at least 15 years. They are all members of the CSP and are all registered with the HCPC. They have all personallly participated in a range of different sports, so they are fully aware of the frustrations of not being able to function at the level that you are used to functioning at. We all have experience of treating individuals after tendon rupture and follow the current Lothian NHS guidelines, whether they are managed surgically or non surgically. If we can help please contact us to book an appointment at our clinic in Eskbank just outside Edinburgh. We are open from 8 am until 8 pm and can normally see you within a few days. We will work with you to facilitate your recovery and if for any reason you cannot reach the functional level that you were hoping for. We can help to liase with the other professionals involved in your care to expedite your recovery. This entry was posted in Conditions we treat and tagged Tendon injuries. Bookmark the permalink.